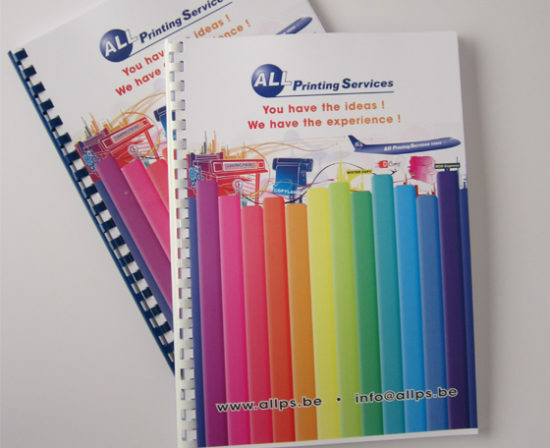 The brochure with plastic rings is a book of several pages, digitally printed or copied. The brochure binded with a plastic spiral is not constraint by the number of pages (one does not need a multiple of four), this in contrast to the booklet. The pages of the brochure can be printed on one side (1 page per sheet) or both sides of a sheet (2 pages per sheet). The number of sheets determines how large the plastic rings must be. The thickness of the plastic spiral determines the price. The color of the spiral can be chosen. Often the color black is used. 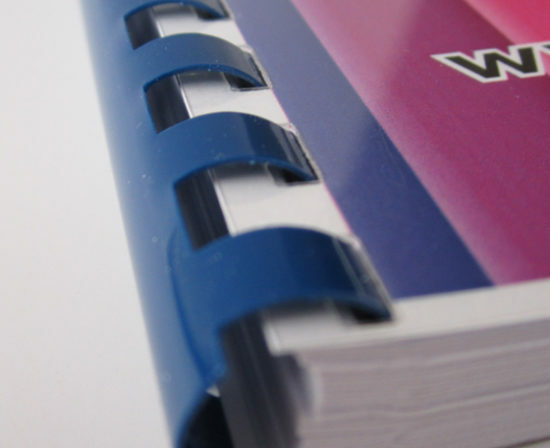 We recommend staying within 400 sheets when using plastic rings to bind a brochure. 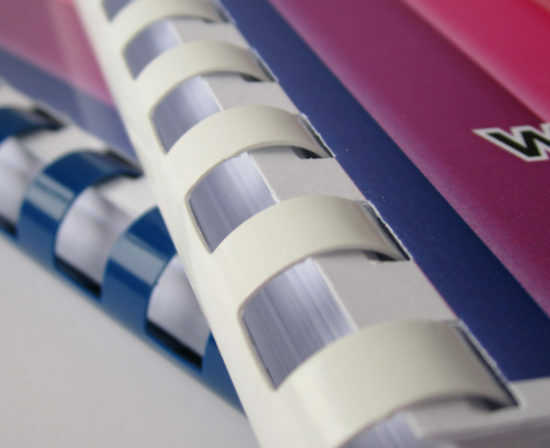 When copying or printing digitally, the brochure can be perforated directly after printing and the plastic spiral can be placed. In this way a brochure with plastic rings can be finished in one day. When the brochure is printed in offset a drying time is to be calculated. Often a plastic is placed in the front and or in the back of a brochure with plastic rings to protect the inner sheets. For improving the rigidity of the brochure with plastic rings, a carton of 160 g until 300 g can be added in the front and or back of the brochure. These covers can be printed and the color of the carton can be white or in a color of choice. Most used sizes for brochures with plastic rings are A4 portrait or landscape, A5 portrait or landscape and A3 landscape. Intermediate sizes are also possible. 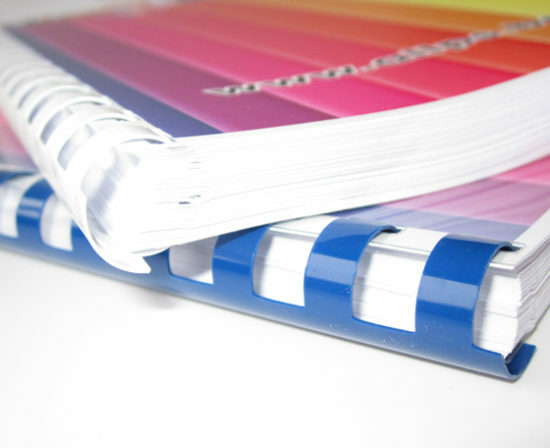 The brochure with plastic rings is commonly used by students to bind their thesis or as an alternative to binders. In French culture, the word mémoire, as in un mémoire (the word has no direct English translation) is used for a (usually short and incisive) piece of writing allowing the author to show his or her opinion on a given subject, logically approaching a series of facts in order to arrive at a recommendation or conclusion. In English it can be deemed a form of essay. An essay is a piece of writing which is often written from an author’s personal point of view. A “maîtrise” (now called Master 1) student’s work, if it was original research, could not be called a thesis, for the student generally did not invent a concept or a new theory at this level. The term “mémoire” thus often came to be used, as it fitted this subject well – showing a fact, research, in a relatively boiled-down format. The pursuit of apprenticeships in research work involved students in editing a “second mémoire”, at Master 2 (formerly DEA) level, often as a feasibility study for a full thesis. This too was of quite a boiled-down format and showed the tools which would eventually allow the student to set out on a thesis. A dissertation or thesis is a document submitted in support of candidature for an academic degree or professional qualification presenting the author’s research and findings. In some countries/universities, the word “thesis” or a cognate is used as part of a bachelor’s or master’s course, while “dissertation” is normally applied to a doctorate, while in others, the reverse is true. The word dissertation can at times be used to describe a treatise without relation to obtaining an academic degree. The term thesis is also used to refer to the general claim of an essay or similar work.